Our target is women that have been suffering from back pain. Most of them have common habits of carrying a heavy bag over their one shoulder. These habits cause imbalance of body as well as back pain. To prevent this problem, they have to carry the bag over the other side of shoulder, every 30 minutes. So, we made an Aerie Care Alarm that they are able to use their left and right shoulder in turn. The purpose of this advertisement is to force women to change the habit of wearing a suitcase only on one shoulder and to balance both shoulders. This solution helps women can keep their bodies’ innate beauty by preventing our body from being unbalanced. 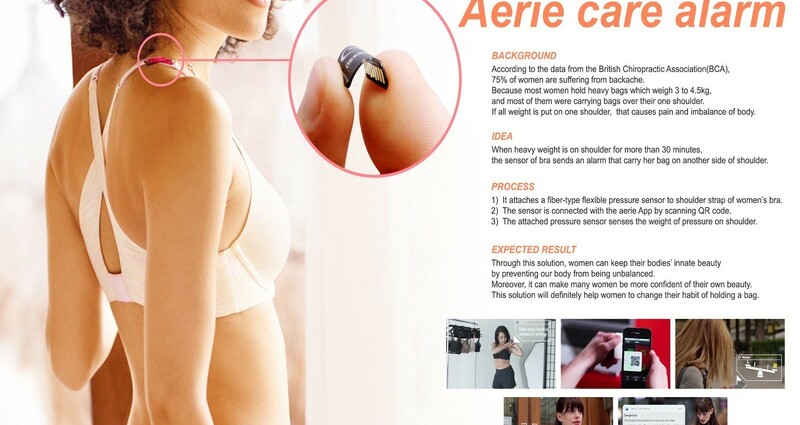 Fiber-type flexible pressure sensor of the bra senses the weight of pressure on shoulder. When heavy weight is on shoulder for more than 30 minutes, the sensor sends an alarm that carry her bag on another side of shoulder.